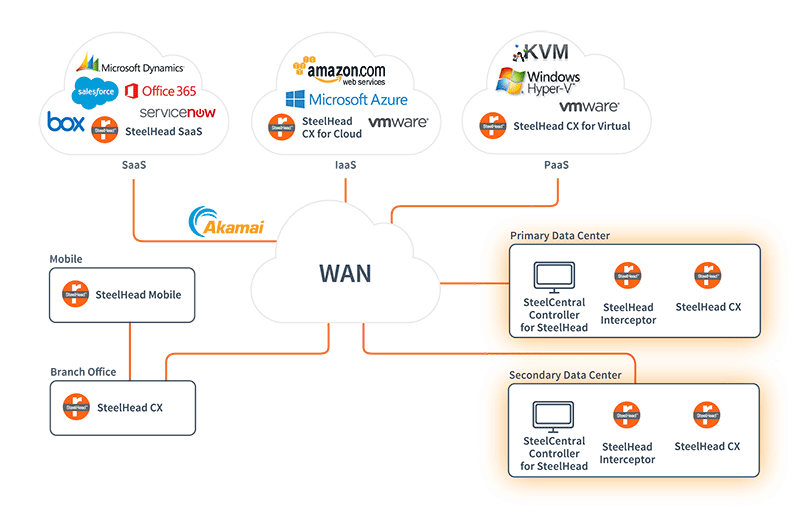 SteelCentral Controller for SteelHead enables you to easily leverage and control hybrid WANs for accelerated delivery, based on your business requirements, of critical applications over faster, more secure networks and less-critical recreational applications over the public Internet. The solution simplifies application performance and path management and ensures secure service-level delivery for business critical applications. SteelCentral Controller for SteelHead also provides performance monitoring with reporting metrics such as traffic levels, application throughput performance and TCP session flow characteristics – to help diagnose and fix problems. SteelCentral Controller uses a wizard-like process for defining application policies based on customer business requirements. It helps you prioritize, secure and deliver applications over any network (MPLS and Internet) based on intent-based, global business policies. It provides easy configuration, monitoring, upgrading, troubleshooting and reporting on your SteelHead solutions including groups of SteelHead CX appliances and virtual or cloud instances. SteelCentral Controller for SteelHead enables you to maximize the ROI of your SteelHead deployment.